We know just how difficult a time it can be when someone close to us dies. The feelings of shock, loss and bewilderment can take over our lives. It is also a time when there are so many things to be done. 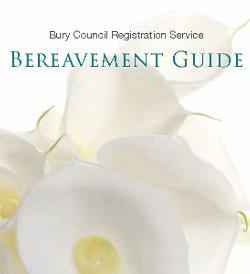 The Bury Council Bereavement Guide is a free publication, which is aimed specifically at helping you through this difficult time. It will help you to access all the information you need to assist you through your bereavement, including suggestions of organisations you might like to contact for support. It will let you know what is required by law and what your choices are within it. The guide will hopefully provide you with a sympathetic, helpful and considerate service, as it is important that you have the most useful and clearest guidance to make sure that the arrangements you make are the ones that are best for you, your family and friends. It also features interesting and informative features and interviews with those involved in the bereavement industry. If you require further help or advice we advise that you call or visit the Register Office. You can also download a PDF version: Bereavement Guide [3Mb], or view the main content by clicking on the links below. Bereavement guide - section 1: What must you do when someone dies, who to contact and what documents you will need. Bereavement guide - section 2: This is a service that lets you report a death to most government organisations in one go. Bereavement guide - section 3: How and where can you register a death, and find information you will need to provide. Bereavement guide - section 4: What you need to do to register a still-birth, who can register it, what information you'll need and what certificates will be issued. What if your loved one died abroad? Bereavement guide - section 5: What you need to know about identifying the person who died, repatriation (or local burial), personal possessions, documents etc. Bereavement guide - section 6: Arranging, planning and paying for a funeral, the role of the funeral director and documents you will need. Bereavement guide - section 7: Sorting out the estate of the deceased, cancelling Council services, applying for probate and what to do if there is no will. Bereavement guide - section 8: Information about flowers, wreaths, tributes, posies etc. Bereavement guide - section 9: There are many organisations that can help and support you following bereavement. Here we a list of some of them, which might be useful to you at this time.